The American Dream: Are We Not Drawn Onward to New Era? "The American Dream: Are We Not Drawn Onward to New Era?" 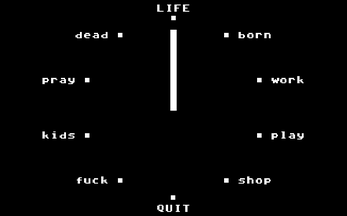 is an experimental one-button game about life, work, some other things, and death. Originally crafted for the GAMMA IV one-button showcase, it has also been ported to Android (available here). Find out in "The American Dream!" It takes approximately five minutes to play and is guaranteed* to provide at least one minute of value! Press 'Z' to do just about everything.